There are many ways to feed our soul that are all about connection. Whether it is music, art, meditation, a beautiful walk, an inspiring idea, book, or some way of giving back, Soul Food is what helps us “plug into” whatever higher power exists that connects us to each other…and, to something bigger than ourselves. 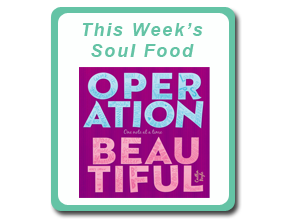 Each week, we’ll be sharing our Soul Food suggestions that will whet your appetite and fill up your heart. We’d love your suggestions too, so click here to share what Soul Food makes you feel the most connected, and why. Self-Compassion – A Path to Happiness! The day Angela and I interviewed Soul Model and happiness expert Marci Shimoff, our whole world (and direction) took a major shift. Here we were, writing this incredible book about women who have discovered purpose and overcome what we thought was everything imaginable through some kind of giving back. Whether it was starting a non-profit, helping a friend, or just being kinder, Marci made us realize we had missed covering the first and foremost way of giving that guides and influences every one of our behaviors, and enable us to live happier lives – giving to ourselves first. What does this mean, in the simplest sense? Girl’s Night Out? Maybe. Shopping Spree? It’s possible. But what Marci was saying felt much less physical than that. What Marci was talking about was a gentle, loving and compassionate approach to our personal lives. A way that honors our own gifts and doesn’t compare us to anyone else. A path that encourages taking care of ourselves first, forgiving ourselves for whatever we think we did wrong, moving through it and being happier as a result. And, let’s face it – when we are happier, everyone around us is too – that is a beautiful gift. Giving to and loving ourselves before everyone else? Angela and I are totally down with that kind of wisdom. In her bestselling book Love for No Reason, Marci offers incredible “Soul Food” that you won’t want to miss – a breakthrough, 7-Step Program that will teach you to Live a Life of Unconditional Love – starting today. Thank you Marci, for all you do for the world! What is a Soul Model? Soul Models touch the hearts, minds and souls of everyone they meet. They are the role models of today, transforming challenge into positive change that helps others. Everyone can be a Soul Model – including you! Go From Tired to Inspired with “Soulutions” for Everyday Life! Realsumé or Resumé? Read the truth about these hugely successful people,and think again. Your “Vagus’ Nerve”: The Secret Key to Happiness that isn’t What (or Where) You Think! © Soul Models 2012 All Rights Reserved No part of this website or any of its contents may be reproduced, copied, modified or adapted, without the prior written consent of the author, unless otherwise indicated for stand-alone materials. You may share this website by any of the following means: 1. Using any of the share icons at the bottom of each page (Google Mail, Blogger, Twitter, Facebook, GoogleBuzz); 2. Providing a back-link or the URL of the content you wish to disseminate; and 3. You may quote extracts from the website with attribution to SoulModels.net For any other mode of sharing, please contact the author(s).